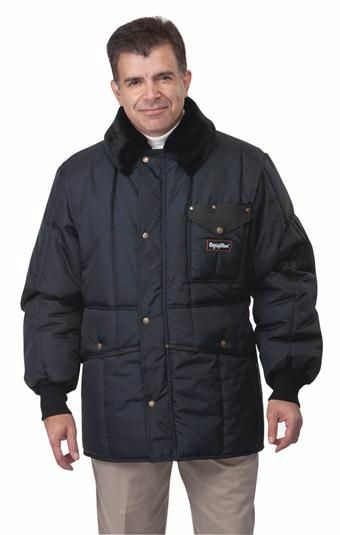 Constucted to protect in the coldest conditions with safety and comfort in mind. Iron tuff garments are time-tested with unmatched quality. Fingertip length, heavy duty two-way zipper with storm flaps over zippers that shut out drafts, pile collars, bulk knit 2x2 stretch nylon cuffs. The oversized pockets will even fit a clipboard. Elastic back band prevents drafts. Set in sleeves withan optional hood. Available colors are navy or sage. Wind-tight, water-repellant 420 denier nylon PAC cloth, high performance insulation of 11.25 polyester fiberfill traps body heat to create warmth without the weight.